Had a great time yesterday at the beer festival in The Guildhall. Went down in the afternoon, two pints of scrumpy cider was enough so I headed home. along with about half of those attending (that's why the crowd above looks a bit sparse). Thanks to CAMRA Cornwall for organising such a great event. 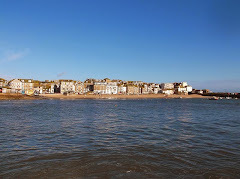 Its been a busy week in St Ives with crowds of visitors - looking forward to a quieter week. There's plenty going on over the next week - so I'll highlight a few events, as ever shamelessly plugging the one's that interest me, are staged by my friends or have provided suitable incentives. This week's blag count is a disappointing one free ticket! St Ives Beer Festival is on at The Guildhall on Saturday (30th) - with more than 50 real ales, ciders and perries. There is live music and games as well. Entry is £3.50 including a souvenir glass. St Ives School Of Painting are running their usual programme of "walk in" classes - no need to book, just turn up, beginners welcome. Life drawing on Saturday (30th), Monday (1st),and Wednesday (3rd). Personal art practice workshop on Friday (5th). More details on their website. St Ives Arts Club members exhibition is open every day from 10.00am - 4.00pm. A varied and interesting collection of work in different media. Theatre company BishBashBosh are staging Surfing Tommies at St Ives Theatre on Monday (1st). Set during, and in the aftermath of the First World War, this poignant drama follows the lives of three members of the Duke of Cornwall’s Light Infantry, on an incredible journey from the mines of Cornwall to the fields of Flanders, and back home again. Doors open 7.30pm. Tickets £7.00 (adult), £6.00 (child). Box Office - call in at St Ives Theatre on The Stennack or call 01736 797007. My wife Jo McIntosh will be running her knitting club for children "Start Knitting With Jo" at St Ives Library on Tuesday (2nd) at 4.00pm. St Ives Knitting Group will then meet at the library in the evening at 7.00pm - all welcome. Also on Tuesday (2nd) St Ives Jazz Club are staging Truro College Jazz Funk Band. I'm told that this is one of the highlights of their programme. Entry is £9.00 on the door or £6.00 for members. Truro College students can get in for £3.00. Doors open at 8.00pm. Cafe Frug - an evening of performance - poetry, music, comedy, film - is on Thursday (4th) at St Ives Arts Club. Doors open at 7.30pm. Entry is £4.00 on the door. 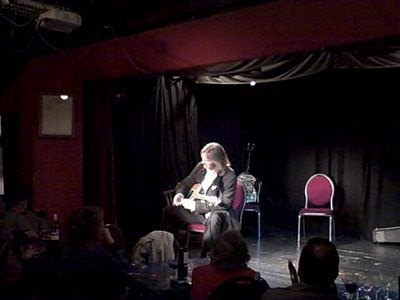 The regular weekly Songwriters Night, hosted by Steve Jones, is at The Western Hotel on Friday (5th) staring at 8.00pm, free entry. Please let me know of anything else that's on - I'll add it to my St Ives Calendar - which has a more detailed list of stuff. The annual beer festival - run by Campaign For Real Ale Cornwall - opens today and runs tomorrow as well at St Ives Guildhall. They will be serving more than 50 real ales, perries and ciders. Free soft drinks for designated drivers. Also - games, live music, food. 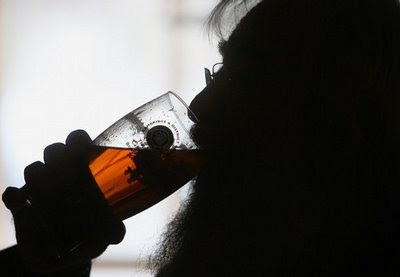 So if you have a beard, your own pewter tankard and like drinking stuff with names like Old Growler and Thumpers Best get along there. I've managed to blag a comp. ticket so I'll be there later today. (CAMRA members free + £2.00 for glass). The Reserve is a 40-acre public open space around Knill's Monument, above St Ives. Visitors can explore the woods, stroll over heathland and discover areas planted with young trees. There are remnants of local mining history and spectacular views across St Ives Bay. This is a community venture supported by many local volunteers who regulalrly work on the site. They meet every Sunday afternoon, 2.00 - 4.00. Current activities include clearing remaining rhododendron from Steeple Woods, weeding rhododendron seedlings on the remainder of the site, looking after newly planted trees (e.g. trampling bracken around saplings), replacing any damaged or missing tree guards and path clearance. The contact for attending is John Mudge - call 01736 798252 if you'd like to help. Volunteers meet by the notice board on the five bar gate, 3/4 way up Steeple Lane on the left. Also a really nice place to visit and take a picnic - and in the summer somewhere to get away from the crowded streets and beaches of St Ives. There is more information on their website - including a map. This is the first of a series of previews of this year's festival - which runs from Saturday 12th - Saturday 26th September 2009. I'll be following up with some previews of individual events - particularly the smaller, less known (and cheaper!) gigs and performances. Many of these don't yet (and may never) feature on the "official" festival website, as this seems mainly focused on selling tickets for the "bigger" gigs at St Ives Guildhall. Firstly - the Guildhall programme is the usual solid, but predictable and unimaginative, line up of established festival artists such as Elkie Brooks, Syd Lawrence Orchestra, Eliza Carthy and The Ukulele Orchestra Of Great Britain. Ticket prices are steep - from £14.00 up to £22.00. As ever no gigs, or ticket concessions, for young people. Also no showcase for young local bands. Two possible highlights though - the excellent Show of Hands return, plus Bellowhead who open the festival on the first Saturday. The closing act on the final Saturday is a tribute band btw - nothing against them BUT this IS meant to be an arts festival - if you want to see f***ing trib. bands you can go to a trib. festival! The programme at The Western Hotel is varied. As ever St Ives Jazz Club will be staging gigs on the two Tuesdays - Partisans (15th) and Empirical (22nd). Ben Waters - the brilliant boogie-woogie pianist is here on Sunday 20th. There is also a comedy night on Monday 21st which sees the welcome return of Gary Delaney. I staged him here last year when we ran a short lived comedy club and trust me he is really really funny. Don't miss either of these. One event I'm really looking forward to is St Ives Community Play performance of Romeo and Juliet. This will be staged outdoors on The Island overlooking Porthgwidden Beach and St Ives Bay. The cast is entirely made up of locals - with professional direction from Sarah Lincoln. Last year - A Midsummer Nights Dream - was fantastic - we took some bottles of Cava, lay out on the grass and enjoyed. It featured Oberon making his entrance on a speedboat across the bay and Titania entering on horseback (on a real horse! - cool - that's high production values for you). Tickets will be around a reasonable £7.00 (tbc) and I'd recommend you don't miss this. Performances are on 16th, 17th, 18th and 19th September (also prior to the festival during August). Poetry In The Square will be on every day from 12.30 in Norway Square - with all welcome. This free event attracts a wide and varied range of performers. Poetry obviously - but also comedy, prose readings and live music. This year St Ives poet Bob Devereux will share the hosting with Rod Bullimore and Anna Chen. You can therefore expect the event to be staged with unusual efficiency, especially when Anna is running the show, but without losing the spontaneity that makes this such a great part of each festival day. St Ives School of Painting are running daily classes in their wonderful Porthmeor Studios overlooking the beach. Most are suitable for beginners and there is no need to book - just turn up. Subjects include life drawing & painting, watercolour, collage and printmaking. I'm putting together a comprehensive events calendar which aims to feature everything that's going on - whether its is in the "official" programme or not. The current "official" festival website only lists gigs at St Ives Guildhall and The Western Hotel - nothing else at all. My guide includes all the stuff mentioned above plus loads more and I'll be keeping it updated on a regular basis - so check it out! Please let me know if there any events you want to see featured. Sacconi Quartet - Music In May. Photo - Katie Vandyck. I've been working on a comprehensive What's On listing for St Ives - using Google Calendar. What is surprising is just how much is going on in town. I thought I'd highlight some of the events - you can go to the calendar for a full listing. St Ives School of Painting will be running their regular "walk in" life drawing classes - on Monday, Wednesday and Saturday. They also run an art workshop on Friday. These are held in the wonderful setting of Porthmeor Studios - part of the historic complex of studios overlooking the beach. No need to book - just turn up. St Ives Arts Club members exhibition opens with a preview today at 5.00. Its then open from 10.00 every day. Always worth a look with a great variety of work. 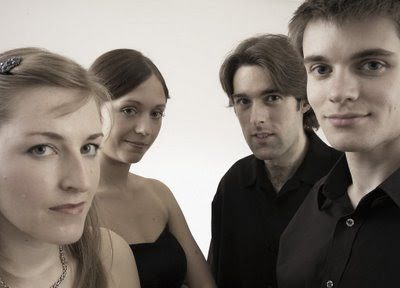 If you like classical music - check out The Sacconi Quartet - performing a series of four concerts at St Ives Parish Church as part of St Ives Music In May. If you want something less intelectually challenging try Freddy Zapp - karaoke night at The Sheaf Of Wheat on Monday. St Ives Jazz club are staging Zoe Rahman on Tuesday night at The Western. Thursday night sees theatre at St Ives Arts Club - No Mans Land. I'll be there, have comp tickets. Also running on Friday and Saturday night. (btw I'm always up for comp tickets - so get in touch if you want me to shamelessly plug your stuff here!). Lovely day in St Ives - sunny and peaceful. Above is a view of St Ives Harbour early evening. I've spent most of this week working on various websites, in particular today St Ives Farmers Market - more on that next week. I've also been working on my St Ives Events Calendar - aiming to make it the most comprehensive listing for the town - so if you know of any events let me know and I'll add them. I'll be getting back to blogging more regularly with more about whats going on in town, a review of St Ives Literature Festival and the first of a series of previews of St Ives September Festival. 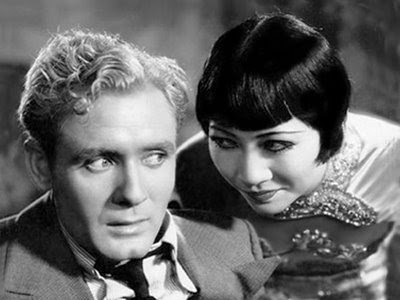 Don't miss Anna Chen's talk at St Ives Literature Festival tomorow (Friday 8th) about Hollywoood screen legend Anna May Wong. She's prepared a lavishly illustrated multimedia presentation with music, poetry and more. Be there - Salthouse Gallery St Ives. 7.00 start. Another pleasant day in St Ives enjoying the festival and spending time with friends. At lunchtime I went over to The Salthouse Gallery and caught Charles Shaar Murray and Buffalo Bill Smith. Followed by the usual couple of pints at The Sloop. We spent some time plotting gigs for St Ives September Festival. More info here soon once confirmed. Tonight I did what I should do more often - but don't do often enough. Simply chilling on Porthmeor with a glass of wine watching the sun go down. Have enjoyed the last couple of days events at the Lit. Fest. Last night Charles Shaar Murray gave us a great preview of his new novel - The Hellhound Sample. This afternoon I headed over to Poetry In The Square. As usual a few of us then went down to The Sloop at 2.00 for a quick pint. As usual we were still there a couple of hours later. Beautiful day in St Ives. After a tense afternoon Cornwall Bluenoses celebrate big style. Next season we'll be meeting up in in The Three Ferrets in St Ives or in Hayle (pub TBA) for every televised game. A few years ago I ran the official Blues supporters club in Cornwall, until pressure of work meant that I didn't have the time. 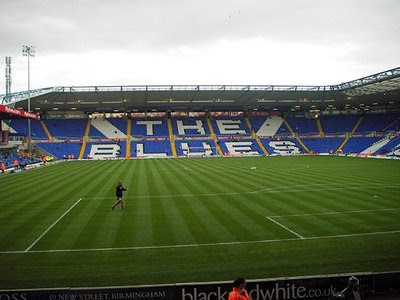 With Blues promotion to the Premiership imminent I've decided to revive it, although in a simpler form than before. Not sure where to meet in St Ives yet. I was going to suggest The Sheaf Of Wheat - but they've just decided to show the Liverpool game on Sunday (3rd May) rather than Reading v Blues, on the basis that they'll get more Scousers in than Blues. Same issue will arise next season if there is a Liverpool / Chelsea / Man Utd / Vile game on at the same time as ours. So need to look elsewhere - let me know any suggestions. To keep it simple I'll not be collecting subs, arranging trips to matches or booking coaches. As above, if anybody else wants to do that I'll be happy to pass on details. Saturday 3rd - We'll be watching the game at The Three Ferrets in Chapel Street St Ives. They have two screens and will be showing Liverpool on one and Blues on the other. See you there.